The year began with such hope. The little hints of the darkness and horrors to come were there, we just didn’t want to see them. I remember gathering a crew of people to join me at VRLA, a Virtual Reality Expo advertising demos of applications on the bleeding edge of technology, alongside such evocative lectures as “Human Digitization and Facial Performance Capture for Social Interactions in VR” and “Hands on VR: Making the Virtual Feel Physical.” After years of writing and filmmaking, VR seemed like a natural next step for me. Walking into the Los Angeles Convention Center, my already high hopes for the event were only heightened when I realized that I had entered on the wrong side of the massive building. To reach VRLA, I had to cross an entire mile of convention floor occupied by a different convention, Bodybuilding LA, filled with so many shiny muscles and bulging jaws that I felt my kidneys rupture — with envy. 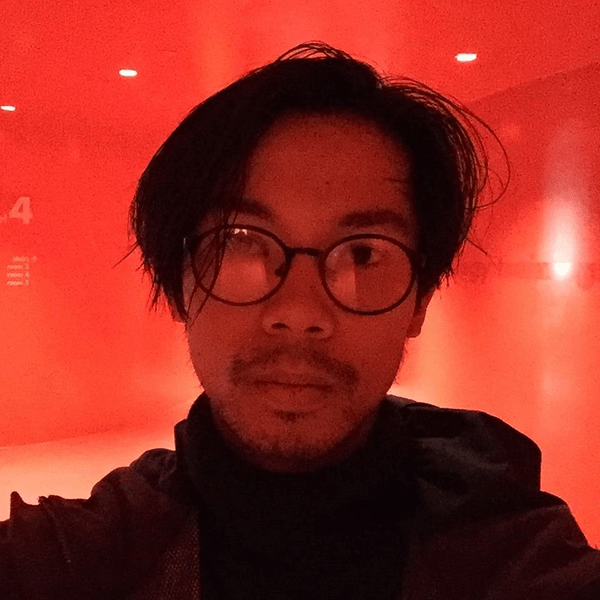 I returned to Los Angeles in 2012, after three years living abroad in Seoul, and soon, in a spidery network of experimental musicians, video artists, upstart curators, and oh so many filmmakers, met Miko Revereza. We hit it off easily, sharing interests in obscure Japanese noise bands, melancholic international films, and karaoke. He had made a name for himself at the time with a seemingly endless string of music videos and concert visuals for the fringe music set, and was nursing the ambition of making a feature film. Like any good male friendship, we eventually reached the point where our knowledge of each other’s pasts and fears conflicted with the false ease of our social personas. At this point, guys decide whether to call it a phase and retreat back the superficial “grab a drink sometime” or soldier on and sign up for all the darkness the other contains. Mr. Revereza saved me that choice over the past year by retreating further and further into the research, development, and production of his first feature film. I’d see him maybe every other week for a brief chat, but we grew increasingly distant as he dove deeper and deeper into his filmic exploration of what virtual reality meant to him as an undocumented immigrant who could always leave the United States but never return. I was surprised when he called one day and requested a real hang-out. He said he had dropped acid and spent the day walking around Downtown LA’s Westin Bonavanture Hotel. And indeed, he had the ethereal openness of both low emotions and high epiphanies — slipping in and out of an ornately intricate form of logic — particular to that drug. He described how the hotel’s futurist white curves and alien architecture guided him to the fourth floor balcony, where he stared through a hole in a shut down business into a dim interior of what he realized was once a Filipino restaurant, decorated with Orientalist window displays of lush jungle greenery, brown-skinned mannequins, and the occasional monkey. 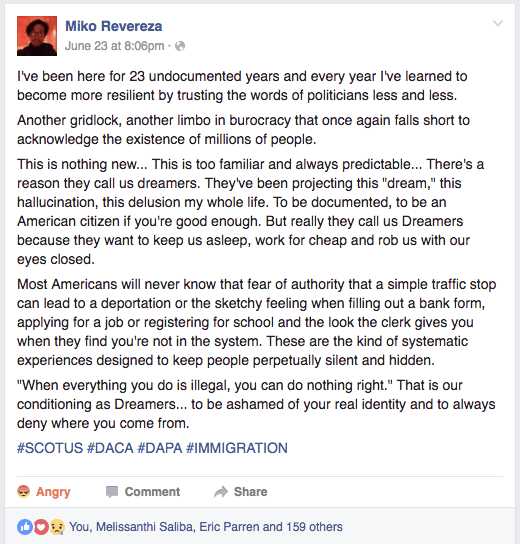 I got lost around there as he somehow segwayed into his growing paranoia that the extension of Obama’s Dream Act (DACA) would be overturned when it made it to the Supreme Court this summer, denying his parents a path to a legal existence yet again. I stopped him and nudged him to get back on track. He was silent for a long minute then told me that he had begun shooting his film and wanted to show me what he had so far. Over the next few months, he’d bring over more scenes, and with each successive screening, I’d bite my tongue with more and more force, as the subject matter began to consume him with the light of a madness I had a hard time seeing without worry. But by May, he had a complete film to show me, and seemed to have stabilized himself in the process of making it. Does Manila Dream of Los Angeles was a culmination of years of experiments, research, dreams, and life experiences that successfully supplanted the arrogance of youthful ignorance and swagger in favor of a darkly intimate introspection. 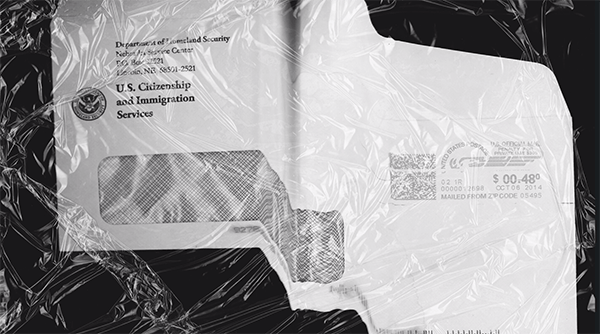 Over the course of the film, he first implies then outright reveals his status as an undocumented immigrant, only to explore its meaning fearlessly. The film raises a complex question: If you are an illegal immigrant, is the reality of belonging, of a homeland, of a life both recognized and rewarded, just a virtual reality? 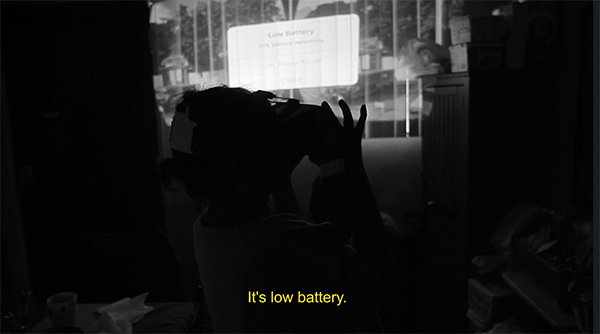 Does Manila Dream of Los Angeles documents the experiences of a group of Filipino immigrants living in Los Angeles, and returns them to the streets of Manila, via consumer-grade virtual reality headsets and the Google Earth app, decades after they left it behind. It starts with his paternal grandparents — Jun and Aurora — as they browse a pixelated replica of their homeland. Aurora, his grandmother, takes the experience as a vacation, gleefully pointing out the bikini-clad women on the digital beach, and has to be directed to stand up from the TV couch so she can swivel her head completely around to take in the whole horizon. Jun, his grandfather, nods compulsively in complete silence as the phone strapped to his head forces him back to a super-flattened facsimile of the country he fled so many years ago. He breaks his silence later in the film in a heartwarming karaoke session, crooning standards to his wife who sways lovingly beside him. Still from ‘Does Manila Dream of Los Angeles’. A slender long-haired stoner named Jet “walks” until he finds a Google car photograph of his ex-girlfriend’s house in Manila, and in a delightful scene, serenades her memory with a real-life electric guitar solo. This panorama of modern updates to well-worn rituals infuses the film with an earnest humor and warmth, respect for a family working tirelessly to maintain their dignity as well as their connection to the homeland. His grandparents use the app to revisit their family homes, only to find, with a melancholy reserved for the innocent, that everything is gone. Miko juxtaposes these moments with mind-bending explorations of a modern digital culture gone power-mad. He lends the film a rhythmic structure by alternating between scenes of his grandparents and black and white stills from his own virtual tours of Manila (through the eyes of a Google Maps car). These corporate photos show street kids mugging at the lens, and shopkeepers staring down the driver. He eventually brings the two halves of the film together in heartbreakingly plaintive sequences of family snapshots distorted with image editing software that make his childhood face drip down the photo, his family’s bodies distending in digital space, stretching unnaturally to escape the image’s bounds. Between the generations of technology and bloodlines, Miko traces a shape at once familiar and unexpected — the spiral. Instead of moving forward with each new generation, the family seems to revolve around the same invisible rituals with no hope of actually engaging their original forms this far from the homeland. Eventually, Miko finally straps the VR set to his own head, drowning out the sounds and movement of a Filipino dancehall in LA. He adopts his grandfather Jun’s silence. I wondered whether this silent mode of travelling was an inherited trait, or a deeper resistance that extends through the generations of male illegal immigrants. It is in that moment that I noticed the marked absence of an entire generation of his family. I’d met both of his parents before, and found them as charming and curious as any friends’ parents. But on screen, they only hover on the edges of the narrative as Miko interviews his grandfather Jun about their family’s immigration process. The elder mentions his son briefly in the strikingly lucid narrative of their family’s journey to America, but just like that, Miko’s father is lost to Jun’s musings on travel visas and the ungraspable nature of American citizenship; we search in vain for more traces of his parents through the second half of the film, reduced to the missing link between facial similarities, physical tics, and speech patterns of Miko and his grandparents. Miko had told me the story of their immigration long ago, but seeing it on film was something else. It was haunting to watch his grandfather tell the story of Miko’s father choosing to overstay his visa and have a five-year old son do the same — thereby relegating their firstborn to the secret prison of an undocumented existence. The inheritance of powerlessness and fear began to permeate every frame. The family can still sing karaoke, but they can’t vote. It made sense to me, then, that Miko avoided any hint of the traditional Western three act narrative structure. There is no central conflict in which a protagonist leaves home to fight for change with the help of mentors, supporting characters, and foils. If there is any such figure, it would be his absent father. The story begins a generation after his father has already achieved the change — moved his family and elders to a new world. He has already broken the old order of racist immigration policies, betrayals after colonization, and bureaucratic chokeholds on the lives of millions of undocumented peoples. But in the resolution of this reality, Miko explores the maddening nature of a time that refuses forward motion, but instead wraps itself in a ring, more akin to The Odyssey than Blade Runner. The film explores what happens after this success — it re-examines every piece of the story, in long extended flashback, from the grandparents to himself. He utilizes a VR travel company to explore what a homeland (and, thus, an ethnic identity) means when it can never be recognized by a society at large. Through this frame, Miko as a narrator searches for an identity beyond the facades of a consumerist Millennial — a political entity constructed of falsified documents and the terror of the truth coming out. In this way, Miko takes on his inheritance and embraces it. Just as his father chose to become a political ghost, he narrates a film while refusing to take on the traditional role of the narrator. A Western narrator acts as an audience’s guide to the relatable transformation of a protagonist’s identity through conflict with a dramatically immovable force. Instead, through his spiral narrative structure, Miko guides the viewer into a deconstruction of the lie in search of a possibly nonexistent truth. As the film glides on without the comfortable structure of a documentary plot, it asks us to create our own order of the scenes. And so, Miko forces us to experience the illegal immigrant’s life as an invention that slowly strangles the original, nascent identity. We celebrated all night after the screening. Over drinks and drinks we talked and talked about the film, its ideas, the feeling of finally completing a feature, and how completing it had freed him of his burden. He finally seemed happy. Then the week came that hit all of us in the gut. Two weeks after Trump took the Republican nomination and Hillary knocked Bernie out of the race, I was out downtown, drinking off the news with a mixed group of those aforementioned musicians, artists, and filmmakers. Many of them arrived fresh from the daylong parties at LA’s Pride Parade, and we were making merry when, at 3am, all of our phones lit up at once. 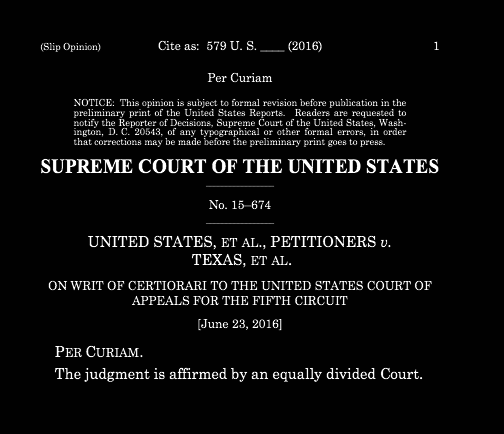 As everyone began gasping in waves of shock about the atrocity unfolding at Orlando’s Pulse nightclub, I read about another tragedy — the Supreme Court making a split 4-4 decision on Obama’s DACA — the one ray of hope for the Revereza family. 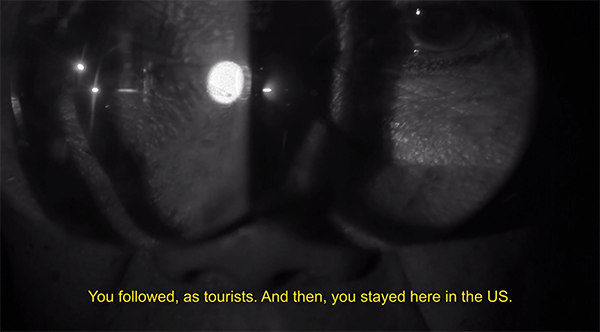 You can see the trailer to Miko Revereza’s debut film Does Los Angeles Dream of Manila here.